It's Christmas time again. Another year is coming to an end but another new year is awaiting us with fresh hope and promises. It's time to count our blessings and share our blessings! It's another eventful year for me. I have been to many events and met many new faces, yet those friends that I have known for years are still my closest friends. I thank God for His great blessings in my life and will look to His unfailing love in the years to come. Christmas is a time of sharing the Precious Gift of God - Jesus Christ who was born some 2000 years ago. Christmas means "Christ has come to us". Indeed He has come to give us eternal life so that whoever believes in Him will never perish. Christmas has been so commercialized these days and every business is trying to grab this opportunity to encourage us to buy gifts for our family and friends. 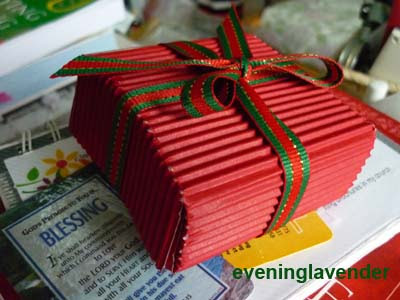 It is nothing wrong with buying gifts but we must know the meaning of giving gift. God is the one who started this spirit of giving by sending us His Son Jesus Christ - the Perfect Gift. Truely, I sincerely hope that you truly know the meaning of Christmas, beyond the fancy gifts and celebration. May you have a meaningful Christmas 2012! May His Joy and Peace surround you.